Atlas Pro Audio Questions About This Unit? Brand New - Dizengoff Audio D4. Save 10% during September Sale! The original circuit was designed by the Recording Engineering Development Department as a replacement for the Siemens V72S amp cards used in an earlier British console. It featured three gain settings (+36, +40, and +46), and a fine trim knob that allowed the user to trim gain by a few dB. The D4 has expanded that range from +20 up to +60 using a 12 step rotary attenuator. Like the original design, the D4 trim control allows the user to fine tune the gain by 2-4dB depending upon the gain switch setting. The sound is huge and openheard on albums recorded by The Beatles, Pink Floyd, and The Zombies between 1964 and 1968. It has incredible detail, and the kind of wonderful coloration that only an EF86 pentode can deliver. Its often considered to be the sound of John Lennons Revolution, which used two console channels in series to achieve an overdriven sound. Signal path transformers are custom wound right here in Chicago. Theyre based on the transformers used in the original, but they take advantage of modern materials. The input transformer is a hi-nickel (80% nickel content) and the output transformer is a lo-nickel (50% nickel) for excellent fidelity. The power supply is internal. Its built around a Japanese Nippo Steel R-core power transformer. It has extremely high efficiency and low noise compared with traditional E-I core transformers and plays a significant part in achieving the D4s low noise performance. 12 position stepped gain control, 20-60dB. Trim control, for fine adjustment of gain. THD+N at 1Khz: 1%, +4dBU, 10-24kHz bandwidth. S/N -90dBA at maximum (+60dB) gain, 10-24kHz bandwidth. Some comments from Matt Newport owner of Dizengoff about the D4. When asked about the difference between Neve vs. Think about it like this: the D4 is probably one of the most detailed sounding preamps you'll ever come across. The REDD47 and the V72 were famous for this, and that's exactly what EMI was looking to create for Abbey Road. The Neve approach was much different. It was solid state, not tube. It has a very thick low end but it's not as detailed. Both sounds are useful in different applications. Transient response is definitely faster on the D4. 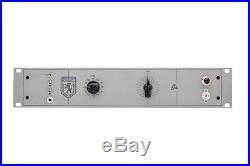 It's one of the fastest preamps I've ever heard, and it's more detailed than any 1073 variant I've ever used. We all know that the Neve really shines when it comes to low-mid punch. Few preamps can touch that, especially vacuum tube preamps. When asked about the impedance and how it works with microphones. Fixed impedance and yes, it's great with low output mics like ribbons and SM7. It's great as a room and OH setup. It's got this great upper mid emphasis that makes it awesome on vox, acoustic guitar, etc. It LOVES a good U47 type mic. At Atlas Pro Audio it is our priority to have great customer service. We are dealers for over 80 lines of the best high-end pro audio gear available. Unauthorized reproduction is prohibited by law, subject to criminal prosecution. The item "Dizengoff Audio D4 Microphone Preamp New Free Shipping Atlas Pro Audio" is in sale since Wednesday, August 03, 2016. This item is in the category "Musical Instruments & Gear\Pro Audio Equipment\Preamps & Channel Strips". The seller is "www-atlasproaudio-com" and is located in Brandon, Florida. This item can be shipped to United States, to Canada, to United Kingdom, DK, RO, SK, BG, CZ, FI, HU, LV, LT, MT, EE, to Australia, GR, PT, CY, SI, to Japan, to China, SE, KR, ID, to Taiwan, ZA, TH, to Belgium, to France, to Hong Kong, to Ireland, to Netherlands, PL, to Spain, to Italy, to Germany, to Austria, RU, IL, to Mexico, to New Zealand, SG, to Switzerland, NO, SA, UA, AE, QA, KW, BH, HR, MY, BR, CL, CO, CR, PA, TT.